Over at the Plum Line, Jonathan Bernstein riffs off a White House infographic on judicial appointments to remind us that although the Senate has been pretty obstructionist when it comes to confirming judges, it’s also the case that Obama hasn’t exactly been a house afire when it comes to nominating judges in the first place. Point taken! 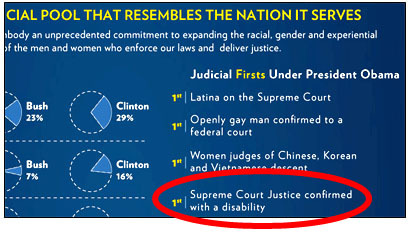 But when I clicked the link to take a look at the White House’s latest graphic wizardry, I was surprised to learn that one of Obama’s Supreme Court nominees was the first ever with a disability to win confirmation. I had no idea. But Google, as always, is my friend, and after first coming up dry on Elena Kagan, I discovered that Sonia Sotomayor has diabetes. Did I already know this? Maybe. My memory is so bad that I couldn’t tell you whether I once knew this and have forgotten, or whether I had never heard this before. In any case, I guess I’ve added two new bits of knowledge to my brain pan today: (1) Sonia Sotomayor has diabetes, and (2) diabetes is considered a disability. Live and learn.